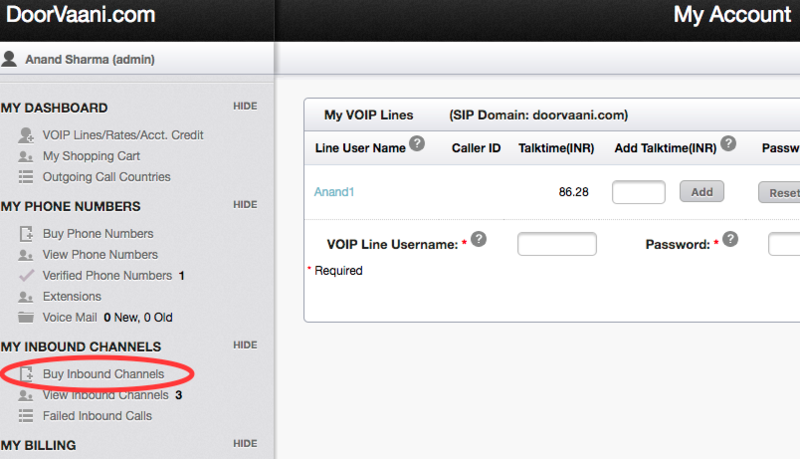 If you have money available in your DoorVaani “Account Credit” and you want to use it to make outgoing calls, then you need to convert your available “Account Credit” into talk-time balance on your VOIP Line. You can convert either all of your available Account Credit or only a part of it into talk-time balance based on your needs. 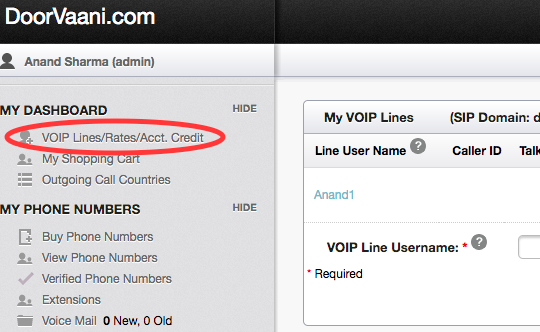 To see your available Account Credit please login into your DoorVaani account and then click on “VOIP Lines/Rates/Acct. Credit” menu under MY DASHBOARD in the left hand side menu bar. On this page you can see your available amount in the “My Account Credit” box on the right hand top corner of the page. Now you can go to the “Shopping Cart” page and checkout your order. You can select “Account Credit” as your Payment Method in your shopping cart. Our DID Phone Numbers come with 2 built-in channels and our Toll-free Phone Numbers have 300 built-in channels. What this means is, you can receive 2 simultaneous inbound calls on your DID Phone Number and 300 simultaneous inbound calls on your Toll-free Phone Numbers. If your simultaneous inbound calls volume is more than what your available channels can handle, then you can buy extra inbound channels from us. These extra inbound channels are shared across all of the Phone Numbers in your DoorVaani account so the extra calls on any of your Phone Numbers will be able to use these channels. 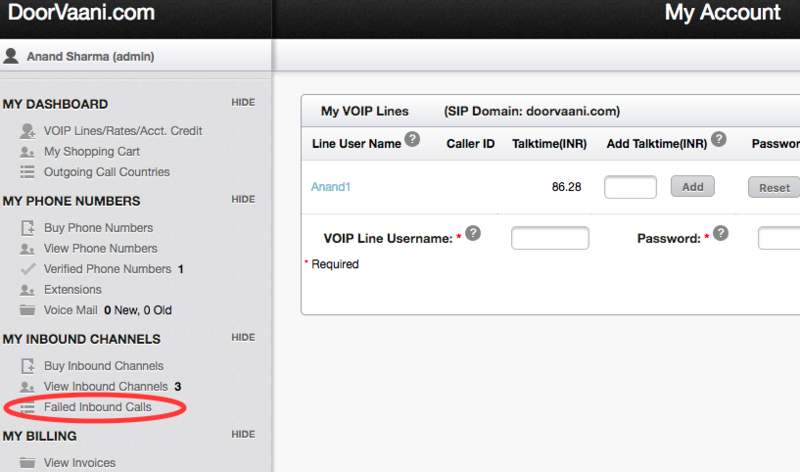 How do I know if I have excessive inbound calls volume? 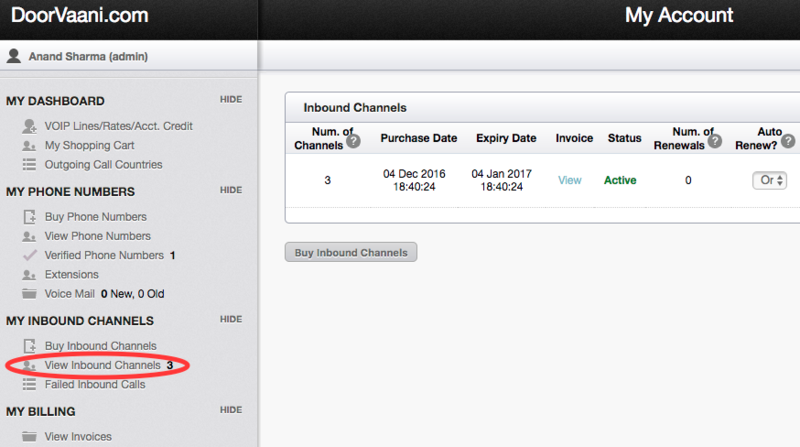 How to buy Inbound Channels? 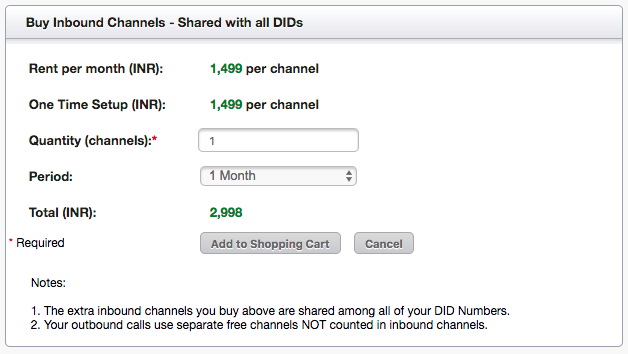 On the “Buy Inbound Channels” page (see below), you can enter the quantity (Number of channels) you want to buy and then select the period in months and add your order to the shopping cart. Once the order is in shopping cart you can checkout your shopping cart. Your purchases are immediately delivered to your account as soon as you make the payment.